400 g can or 2.5 kg can (if you have ever, as is common in Italian families, canned a 10 to 20 litre jar of tomato sauce, then you will definitely value the container size for these San Marzano tomatoes). The tomato par excellence. San Marzano. “San Marzano,” the anti-symbol of the standard EU-tomato, which grows throughout the year on rock wool mats under acrylic glass ceilings into colourful, watery substances. It received its name from the area of San Marzano sul Sarno, a village between Nocera and Sarno, in the very South of Italy. A few years ago, a virus decimated the tomato stocks whithin a very short time; the seeds would have been lost for good if the provincial government had not saved the last stocks as a cultural heritage. It is because of the Italian “Slow-Food” industry that the propagation and cultivation of genuine San Marzano tomatoes could be taken up again a few years ago, building on the preserved gene reserves. Meanwhile, a number of farmers have begun to take part in the project. 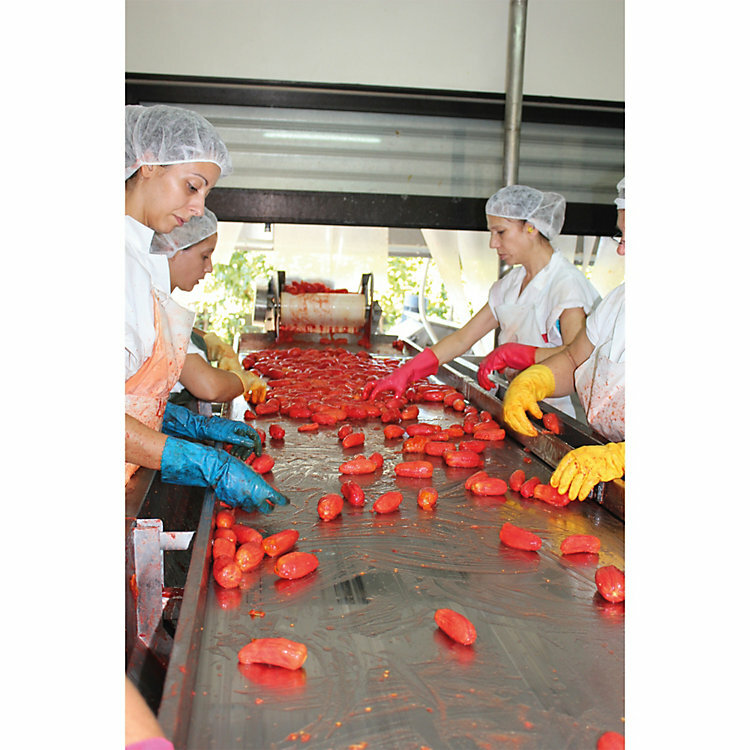 SanMarzano tomatoes ripen in phases and one harvests them successively, seven or eight times, and even more frequently from July to September. Their taste is as overwhelming as the smell of the fields on which they grow. Even in the can their high quality expresses itself: whole pieces of fruit (which are still quite sizeable) are inside; they are in their own juice that tastes like the essence of the tomato. We receive them from a regional business that not only cans the tomatoes but also plants them. Since we have had them in our range we have continually compared them with other varieties of canned tomatoes in regular taste testings – and we have always considered them the best.